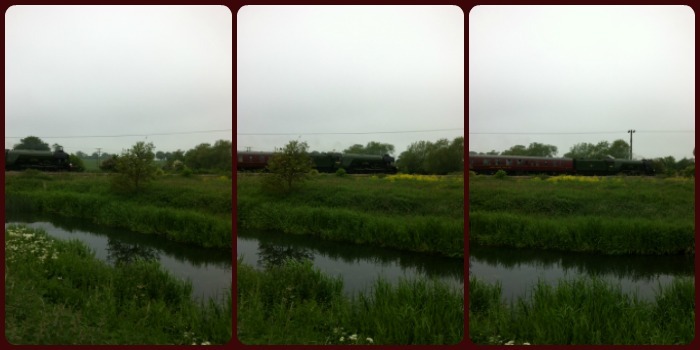 Today we caught a glimpse of the the world’s most famous locomotive - the Flying Scotsman. My parents mentioned to me that this historic steam train was going to be passing on the railway tracks near to them in Burton Latimer, Northamptonshire. My Dad was keen to see it and I thought it would be nice to go with him. The only thing was that it was passing early in the morning so it meant I had a mad dash first thing this morning to get up there in time! On arrival at my parents house, I left Baby R with my Mum, picked up my Dad and drove to their local park (Pocket Park) where you can see the railway tracks. We weren't sure how easy it would be to park nearby but we found a spot and walked through the park to pick a viewing spot. There were lots of other people already there but still plenty of room. A few normal trains went past which everyone would get excited about for a few seconds until they realised they weren't the steam train! Then it was time for the historic train to make its' appearance. It was very quick. I was expecting a bit more noise and a bit more steam but at least we can say we did see it! It wasn't that exciting for Little Miss A but the experience left some impression on her as when we got back to the house she re-enacted it all for my Mum - they stood outside as pretend trains went past and she kept saying 'not that one, that's the wrong train!'. There's lots of information about the history of this steam train and where you can see it in action on the Flying Scotsman website.